Smart and Sun Cellular, the wireless services brands under PLDT Group have jointly launched today the first 'tri-net' unlimited postpaid plan - the Unli Tri-Net Call and Text Plan 899. The postpaid plan offer is designed to make unlimited calls and texts to the country’s biggest subscriber network with 72 million active users under PLDT group’s ‘tri-net’ brands - Smart, Sun Cellular and Talk ‘N Text. “When it comes to unlimited calls and texts, Smart and Sun Cellular’s Unli Tri-Net Call & Text Plan 899 is the ultimate postpaid plan,” said Charles Lim, EVP and head of wireless consumer business of Smart and Sun Cellular. “With the combined power of Smart and Sun Cellular’s mobile network, our subscribers are also assured of the most extensive and reliable coverage available under one postpaid plan,” Lim added. To subscribe to this postpaid plan, subscriber may apply at any Smart Store or Sun Shop. For only P899 a month, subscribers of the plan can enjoy instant unlimited calls and text to Smart, Sun Cellular and Talk ‘N Text, without having to register or to dial access codes. 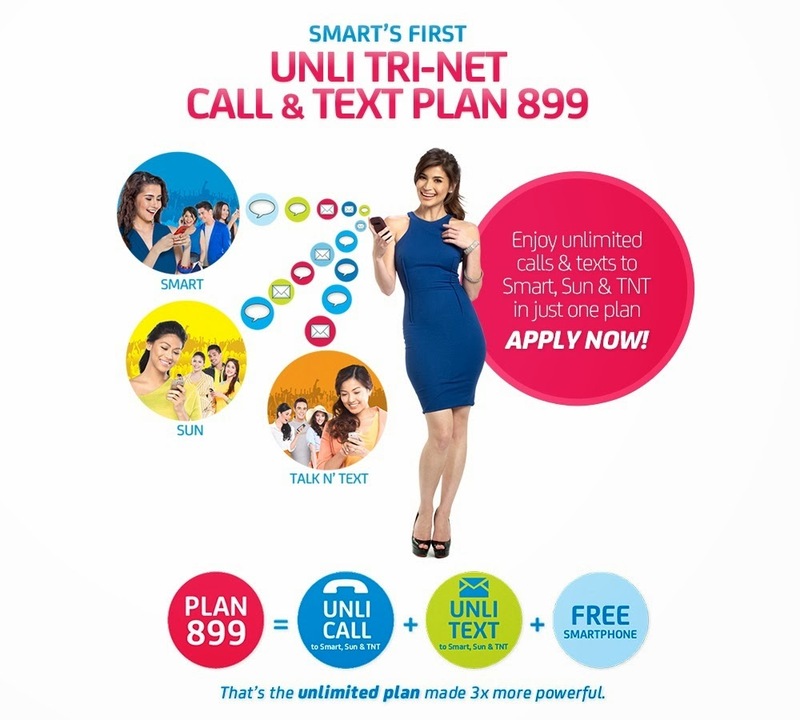 Subscribers of the Unli Tri-Net Call & Text Plan 899 will also get to choose the free smartphone of their choice from the lined-up handset offers of Smart and Sun Cellular. “We have been offering a wide range of smartphones – from the high-end to entry-level models – bundled with our equally wide array of postpaid plans that suit our consumers’ budget and lifestyle,” said Lim. The Unli Tri-Net Call and Text Plan 899 can be upgraded with Smart’s Flexibundles or Sun Cellular’s Mobile Internet Power Up Add-ons. Flexibundles are call, text and data packages that Smart Postpaid subscribers can mix and match to power up their postpaid plans. Subscribers only need to text the keywords to avail of Flexibundles such as daily, 7-day or 30-day UnliSurf, Always On, All-Net Talk, All Net Text and more. Power Up Add-Ons for Sun Postpaid subscribers offer more affordable mobile internet rates with the discounted bundles like iPlan149 for 20 hours of mobile service per month, iPlan399 for 60 hours and iPan799 for 30 days of unlimited mobile Internet surfing. The cost of the added Flexibundle or Power-Up Add-On will be billed above the monthly service fee. “With these special postpaid plan features, our subscribers can personalize their plan and make the most of their smartphone through our data services. They can continuously enjoy social networking, mobile browsing or using apps, even without Wi-Fi,” Lim added. As the market for smartphones continues to expand, the PLDT wireless group posted accelerated growth for two consecutive quarters in its postpaid business, maintaining leadership in this segment with 2.3 million postpaid subscribers (combined Smart and Sun Cellular) at the end of September 2013. Smartphone penetration in the Philippines is growing at 300 percent each year, with 15% penetration rate as of 2013. Smart Postpaid aims to contribute to the growth by launching innovative postpaid plans offering a wide range of devices to expand smartphone ownership and data usage to cover all market segments. For more information on the Unli Tri-Net Call & Text Plan 899 and other postpaid plans, visit www.smart.com.ph or www.suncellular.com.ph.